Hilden Homes prides itself on its role as a leader in the new home construction industry; a position we intend to uphold. We had the opportunity to participate in an energy efficiency initiative, which we embarked upon in the spring of 2017. Ontario is transitioning to low-carbon housing, as a part of Ontario’s Five Year Climate Change Action Plan. This Action Plan features a strategy designed to target both policy and practice, at a manageable pace. As such, the Ontario Building Code was amended on January 1, 2017 to reflect a significant increase of focus on energy efficiency in homes. The future holds more amendments to the Code, with the end goal of new houses being built to be Net Zero by 2030. Net Zero homes will be designed and built to produce as much energy as it consumes for a year. These ambitious initiatives are only successful through the dedication and participation of all levels of government, industry stakeholders and educators, in addition to the builders of our communities. Union Gas sponsored the Optimum Home Program, in partnership with EnerQuality, to encourage builders to become ENERGY STAR® for New Home Participants. The Program provides consulting services from leaders in building sciences, to assist builders in cost-effectively meeting the new ENERGY STAR® v17. ENERGY STAR® (see footnote) qualified homes are at least 20% more energy-efficient than those built to minimum provincial building code standards, which means energy savings and a less harmful impact on the environment. 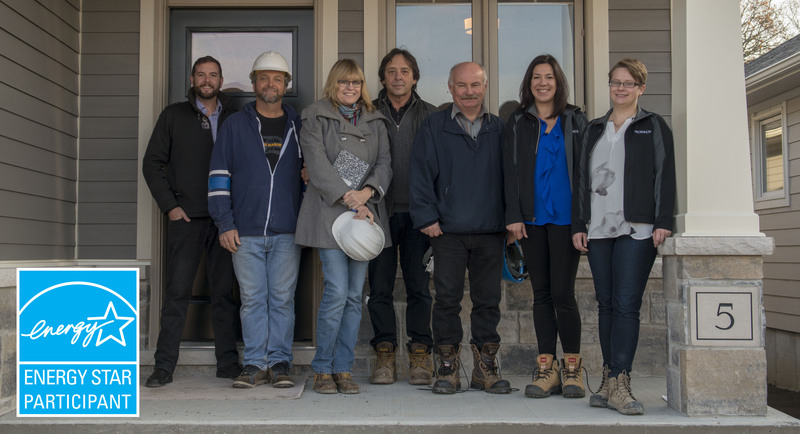 Hilden Homes was invited to be a participant in the Optimum Home Program and we began the process of designing and building our Discovery Home in June 2017. The process required cooperation not only from the builder, but all of the sub-trades and suppliers as well. Building an energy-efficient home is a team effort, which is why all trades are involved in the process from the beginning and undergo trades training program. The actions of one trade affects every other trade and therefore co-operation between all trades is paramount. Effective Insulation: Properly installed and inspected insulation throughout the entire house ensures even temperatures throughout the home, reduced energy use, and increased comfort. High-Performance Windows: Energy-efficient windows use advanced technologies to help keep heat in during the winter and out during the summer; optimizing the heating and cooling systems year round. Tight Construction: Sealing holes and cracks in the home’s ‘envelope’ helps to reduce drafts, moisture, dust, pollen, and noise. Particular attention to the air barrier to ensure it is installed correctly and any rips or tears are properly sealed, is also important to the overall seal of the home. A tightly sealed home reduces heat loss, improves comfort and indoor air quality while reducing utility and maintenance costs. Efficient Heating and Cooling Equipment and Products: Energy-efficient heating and cooling systems can be quieter, reduce indoor humidity, and improve the overall comfort of the home. All supply ducts are sealed and designed to provide an even temperature throughout the home. When properly installed into a tightly sealed home, the equipment won’t have to work so hard. Heating and cooling equipment is sized and specified by a trained professional to meet the requirements for your specific home, without unnecessary oversizing. A Heat Recovery Ventilator (HRV) is installed, balanced, and interlocked with the furnace fan to provide controlled mechanical ventilation. The HRV is designed to run continuously, with heat recovery and subsequent cost savings. Homes may also have other ENERGY STAR products, such as lighting fixtures, compact fluorescent bulbs, or appliances that will also reduce the energy used in the home. Once the Discovery Home was completed, a certified energy advisor conducted a walk-through inspection and blower door test to ensure adherence to quality standards. The blower door test ensures that proper building practices were followed during the construction process to establish a tightly sealed home. (Hilden Homes – Discovery Home – Blower Door Test) All ENERGY STAR qualified homes are third-party verified which gives the home buyer peace of mind that they are making a smart investment. A certificate from Natural Resources Canada (NRCan) acts as your physical proof that your home performed to the strict guidelines and specifications. Home buying is complex enough without having to know all the details of what makes a home energy-efficient. Instead, look for the government-backed ENERGY STAR label to easily identify ‘Best in Class’ homes that are truly energy-efficient. This process has validated that our company presently designs and constructs to a high level of energy efficiency; a fact we are quite proud of, as an industry leader. We believe that all companies should evolve with the industry and Hilden has always chosen to lead by example. We look forward to implementing a program which supports the needs of our buyers, communities and environment, in all of our future homes. Hilden Homes’ ENERGY STAR for New Home Participation has encouraged our company to commit to building Phase IV of our Belleville subdivision Mercedes Meadows as ENERGY STAR qualified.